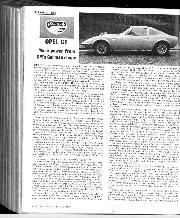 During last month we had an enjoyable break from the normal run of modified production saloons as the well-publicised, but little seen, Opel GT passed into our hands for a short period equipped with some equally well-known Steinmetz tuning equipment. First shown as a prototype in 1965, the Opel 1.9-litre GT went into production in the latter half of 1968, and met with approval from all those who had felt that all Opels were boring, though the specification is really no more exciting than an MGB GT. However, the end result is not a lot more modern in style and handling than the British car, and most press reports (including our own by D.S.J. 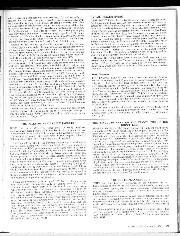 in 1970) indicated that the German GM division were onto “A Good Thing”. Klaus Steinmetz is an ex-BMW works racing team manager who left Munich several years ago to concentrate on the development of the Opel engine and chassis range, especially of the big straight-six Commodores and the four-cylinder cam-in head Kadetts of 1.9 litres (the same engine as is used in the Manta and GT, of course). In Germany and throughout the Continent, Steinmetz Opel tuning parts and knowledge have become much sought after, largely because the Kadetts have proven very successful in Swedish rallying hands, while Commodores have had their moments in international saloon car races. 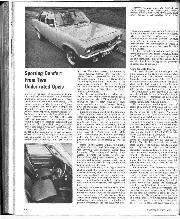 The car we tried was an automatic, fitted with a straight-forward German Steinmetz conversion, whereas future converted Opels in Britain will be further modified toward smooth performance by ex-works Mini driver John Rhodes. The latter gentleman was to have driven an Opel in European Touring Car Championship events this year, but because the drive did not materialise he set up John Rhodes Turning Ltd., Steinmetz UK distributors at 191 May Lane, Kings Heath, Birmingham B14 4AW. Currently JRT plan to offer three stages of tune for all r.h.d. Opels save the six-cylinder models, and the kits should be on the market early next year. Because the Manta uses the same 1.9 engine as the GT, it’s likely that the first proper r.h.d. British kits (which have been developed in part-association with Piper Engineering in Kent) will be for that likeable four-seater coupé. 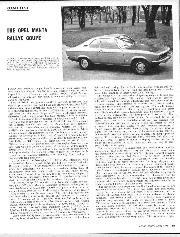 As with all Opel GTs our test car was a l.h.d. machine in standard trim, save the engine parts and 5½ inch alloy wheels, which were shod with 165-section Goodyear GP radial-ply tyres. The stage 1 engine kit is said to boost power to 107 b.h.p. nett (compared to 90 b.h.p. in standard form), thanks to redesigned inlet and exhaust manifolding, reprofiled camshaft and single Weber 40 DCOE carburettor. The GT also had an aluminium rocker box cover, but we have excluded this non-productive item from the total cost of conversion parts at £78.50. Breaking that price down into individual items, we found that the inlet and exhaust manifolding came to £33.50 (£13.50 and £20 respectively) whilst the carburettor cost £31, assorted gaskets and linkages £2 and the deeper breathing cam-shaft £12. 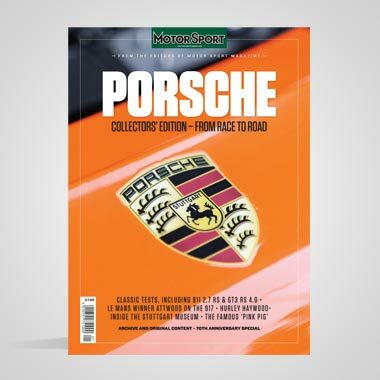 The higher stages of tune include a cylinder head porting modification (stage 2 at an extra charge of £39.50) rated at 123 b.h.p., and a final fling, claimed to provide 140 b.h.p., with a big valve cylinder-head and twin double-choke Weber carburettors. The “top of the line” kit costs £168.50, excluding any fittings charges. 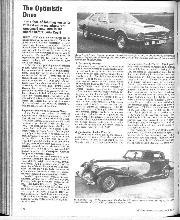 General Motor’s public relations people in London have taken a keen interest in what Rhodes has been doing (the factory approve many Steinmetz kits in Germany, as they are required to do by law) and it was through the usual chain of Opel UK command that we obtained our car. Opel dealers will further act as fitting agents for the Rhodes parts, if all goes to plan. So we left an extremely dirty Ford sitting amongst the gleaming pack of Opels at Mendells in Golders Green, and set about re-acquainting ourselves with the very comfortable and sporting cockpit that comes as part of the GP coupé. Although our car was as shiny as the rest of the press demonstrators, we couldn’t help noting that the wheel arches bore evidence of the difficulties of precisely judging width: twin racing mirrors were provided and there are rear side windows. But one still needs to be cautious about city driving, especially when swopping traffic lanes—the mirrors tend to show the accident after it’s happened! Incidentally both the aeroflow grille and on/off air switch fell off on our way home, so not all German cars are faultlessly finished in comparison to British home products, some of which even cover a full test week without scattering control knobs and other minor components about the interior. At first the automatic choke of the GT defeated our early morning starting attempts, for it’s imperative that the throttle is not dabbed further after the first depression to ensure that the auto choke is engaged. The three-speed GM Strasbourg automatic gearbox tends to provide somewhat lumpy changes at first, but we overcame this slight inconvenience by using second gear hold until both transmission and engine were slightly warm. A sporting air-cleaner for the Weber carburettor betrays the conversion by hissing at low speed and gurgling heartily beyond 3,500 r.p.m. Tickover speed was a creditable 500 r.p.m. for most of the test; again it was important not to blip the throttle at all, otherwise the engine would stall upon releasing the accelerator. Pushing the efficient central auto lever into neutral increased tickover to 12-1500 r.p.m., which partially explains our traffic-ridden fuel consumption figures in the 18 m.p.g. bracket. Somehow the demonstration bookings for this Steinmetz GT were scrambled up before we could take performance figures on a fifth wheel, but some quick runs utilising the stop-watch corrected speedometer indicated a 0-60 m.p.h. 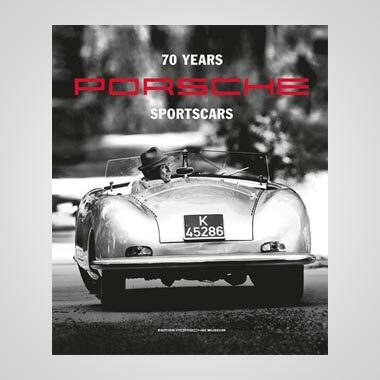 time of 10 seconds, which is not a shameful performance for a steel bodied 2-seater with automatic transmission, and is more than enough to deal with GT-badged saloon cars, unless you count the 3-litre Capri which took slightly over 10 seconds to reach 60 m.p.h. before the engine was uprated for this year’s Motor Show. 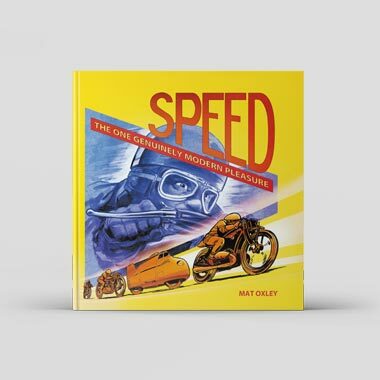 What really did impress was the way in which the speedometer would swivel round to indicate 90 m.p.h. if one accelerated from 50 m.p.h. or so in top. We held the car easily at this velocity with three people crammed on board and found that the excellent body shape allows one to use half throttle at anything up to 90 m.p.h. with consequent benefit to fuel consumption figures. Flat out we managed 120 m.p.h. according to the speedometer with ridiculous ease (though under favourable circumstances) as the car just seems to cut through the air and become better mannered the faster one goes. In town the automatic transmission was dispensed with in brisk accelerating stints, because it always engages third as one shows up for the next set of traffic lights, and the driver felt the brakes should be preserved for something better than a heated demise on the Marylebone road. The combination of good disc/drum braking, and reliable cornering manners via transverse leaf i.f.s. and superbly restrained live rear axle, was put to excellent use in conjunction with the conversion as soon as we slipped off along a country lane. The automatic lever instantly selects any of three ratios, providing that the driver has assessed his speed correctly, and we found the 45 m.p.h. first hold—marked L—and S for the second slot, allowing 70 m.p.h., were very useful aids indeed. 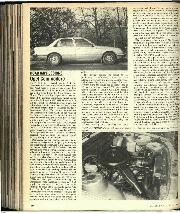 Maximum engine speed is 6,150 r.p.m. as standard, a yellow warning band commencing at 5,800 r.p.m. and we stuck to this figure in the absence of any instruction to the contrary, besides which the Opel four isn’t really fond of 6,000 r.p.m. Overall we left the car profoundly impressed by its ride and handling (again) and freshly thoughtful about its remarkable cruising ability, for our rough check had shown only a small percentage error from the speedometer, and a genuine 110 m.p.h. can be maintained in true GT style with a Steinmetz kit, with a small power surplus in hand. It is a pity Opel do not market right-hand drive GTs. Obviously JRT and their sub-contractors will have to apply themselves vigorously to obtaining the best traffic manners commensurate with city fuel economy. The power potential is already evident and could provide a welcome boost for the Manta owners who dislike reading Ford bootlid badges. Much more exciting though are the tales from a French journalist colleague who has tried a 2800 Commodore with Steinmetz Road and Rally stage tune, yielding 180 b.h.p. DIN at 6,400 r.p.m. (compared to 145 b.h.p. in production form). This triple Solex 40-mm carburated device managed 131 m.p.h. with appropriately startling acceleration. 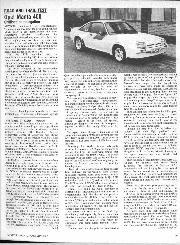 In fact that road-going Commodore should equate approximately with the German Capri RS2600 and the Broadspeed/Super Speed/Raceproved-Weslake/Willment-tuned British 3-litre Capris. On the track Steinmetz has also tried to keep ahead of Ford Germany, designing his own crossflow cylinder head and ensuring that all the right parts were homologated for Gp2, but his hoped for 300 b.h.p. was never handled well enough, or sufficiently reliable without dry sump equipment, to catch the smooth Ford Germany Capris driven by a number of hot shoes. Good luck Mr. Rhodes, may we also hope to see that famous tyre-smoking approach demonstrated on the race track again next year, only this time with a bulky Commodore held at right angle to the track, instead of a Cooper S?